We started the ROWE Stress Test to prove that the modern Made-In-Germany ROWE product lineup is an excellent choice for your European car. Now that the results are trickling in, we get the opportunity to back that claim up with real numbers. We sent ROWE oil changes (complete with MANN filter) to all types of different engines and driving styles to get the biggest variety in the test. This week we’re taking a look at William T’s 2008 Mercedes E550, which comes equipped with a 5.5l V8 called the M273. The M273 V8 is based on the M272 V6, just with a pair of extra cylinders on the end. It’s the successor to the popular M113 which itself was an M112 with a pair of cylinders stuck on the end. The M273 features all aluminum construction (block and heads), forged connecting rods, sequential computerized fuel injection, double overhead cams with continuously variable timing, 4 valves per cylinder, and the notorious magnesium variable runner length intake manifold. There are two versions, the E47 and the E55 which, as you guessed, supply 4.7l and 5.5l of displacement respectively. 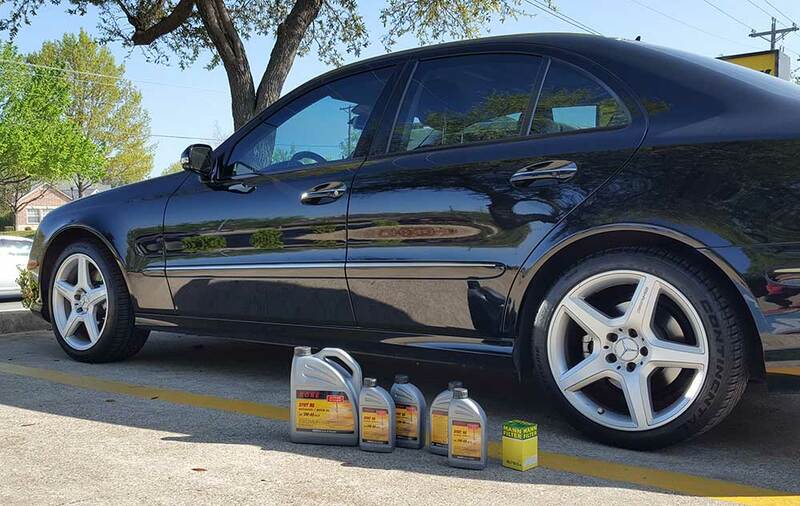 William has the larger E55 in his very shiney E550, and when it was new it was good for nearly 400hp. Not bad. He purchased the car in 2012 and immediately had the oil tested. It showed slightly elevated sodium and potassium levels which was suspected to be a bit of coolant leaking into the oil. Since then, those levels have decreased and his engine is very healthy with 85,000 miles on it. This is a commuter car, so mixed highway and city style conditions are what it sees the most. Now, let’s take a look at how the ROWE SYNT RS 5w40 did in this beast of a motor over a 5,000 mile interval. One interesting thing to note is that the Mobil 1 used prior showed increased Moly levels in it. Molybdenum is a popular friction modifier which is widely used in engine oils to add protection on wear components, but it also has some downsides. Just head over to Bob Is The Oil Guy and do some searching about the use of Molybdenum (specifically Molybdenum DiSulfide) in engine oil to see the mixed reactions both ways. Either way, the ROWE is able to do a great job without it, so there you go. Thanks for letting us use your engine as a demonstration William, we’re glad you like the oil and wish you many thousands of good hard miles with your Mercedes! Looks good to me, based on my limited knowledge. Calcium is high; calcium being a motor oil additive. BG brand motor oil has high calcium for example. 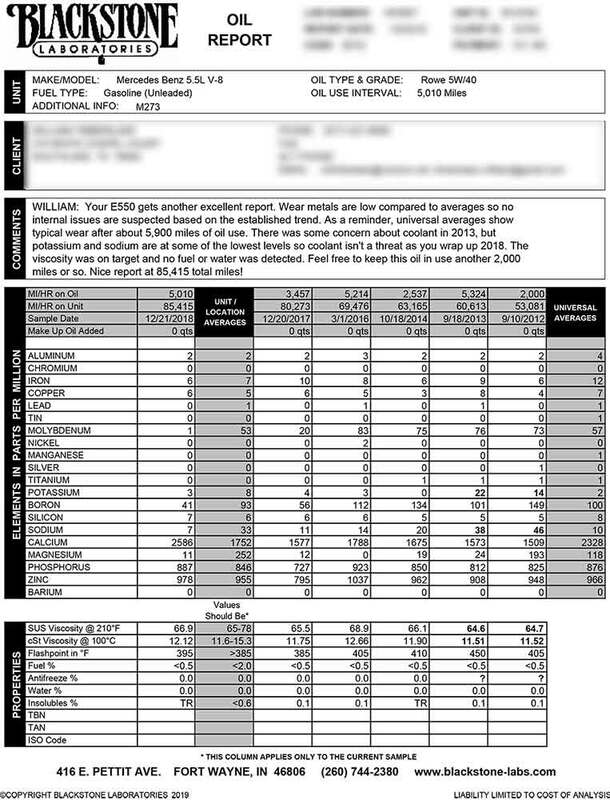 Would be good to see a sample taken at 5900 miles, which is considered “average” by Blackstone Labs. Also would like to see TBN and compare it to new oil. Thanks for sharing the article with detailed report, really worthwhile. Only 5,000 miles on 9 qts of 5W-40? Doesn’t MB recommend 10,000 mile OCIs on this engine? Yes, but for this test most participants wanted to try less miles to start out. Blackstone suggests moving up in small increments to see where you end up, and personally I think the extended factory intervals are only designed to save dealers money on their maintenance plans, while positioning an engine to last far fewer miles. It’s 2019, we see a lot of 10 year old, 100k miles cars having issues they should NEVER be experiencing. We recently got asked if we sold entire transmissions for 2nd gen Audi TT’s. I think long life and lifetime fluids are the main contributed to this new disposable lifestyle we are coerced to live in by those who see fit to make the most money on it. Sorry that got a little political, in the end yes, we would love to stretch the change to the 10k oil change recommendation and I do believe it will be able to pull it off just fine. I agree, “cost of ownership” has long been a driving factor for many questionable scheduled maintenance intervals, and I feel that many oil specifications and oil change intervals are determined only to meet financial incentives (e.g., CAFE requirements). But 9 qts is a LOT of oil! 10,000 miles sounds like it should be a walk in the park for a dual-rated 5W-40 synthetic. And doesn’t this engine use a dielectric sensor in the oil as well as the more typical engine operation algorithm to determine oil life? What was it showing for remaining oil life? I guess I’d like to see more supporting data for all of these tests. Driving style (city/hwy), climate (arctic/desert), geography (flat/mountainous), oil volumes, recommended OCI vs actual OCI, OLM readings, OE-recommended oil, previous oils used (especially on an extended history like this one), etc. Maybe even owner perceptions (appearance, smell, feel)? Just my feelings, of course. Obviously good results at 5000 miles. I agree with Greg that 9 quarts should definitely last longer than the usual 5 quarts in many cars. I also can see that 10,000 is to benefit the dealer by doing less oil changes. Probably saves them a half million per year, just for the US alone. A bypass filter plus the excellent oil will easily go the full 10k, and result in less wear.